Soft Tissue Therapy is the assessment and treatment of the body's soft tissues i.e muscle, fascia, tendons and ligaments. We use deep massage as well as specific stretching and neuromuscular techniques to treat you effectively. Everyone has a body and every body could benefit from STT! The first time you come, we'll have a thorough 10 minute consultation. We'll talk through your history, why you've come for a treatment and what you aim to get out of it. I'll take you through some tests to try and identify any areas of tightness or restriction in your muscles. The best bit! Depending on what suits you, your massage may involve lots of dynamic movement; allowing me to effectively target those specific problem areas. Alternatively, it may be a more calming experience if that's right for you. I'll use a variety of techniques and we'll communicate throughout to be sure I'm treating you accurately to get the best results. Wear comfy, loose clothing and be ready to relax! After the treatment, we'll reassess to see how you feel and move. We'll talk through any stretches or strengthening which could be beneficial and decide on a plan going forwards! I encourage my clients to keep in contact after the treatment. Feel free to text or email me to let me know how you're feeling in the days after the massage and beyond. I really care about your progress and the feedback helps me treat you most effectively going forwards! Please note, payment may be asked for prior to treatment and a minimum of 24 hours notice is required if you need to cancel your appointment; otherwise a 50% cancellation fee will be applied. I'm Lorna, and I want to get you out of pain! My background in theatre showed me how much strain we put our bodies though when asking it to 'perform' repeatedly day in, day out. Whether this be a for a show or a day at the office, we all get niggling aches and pains. Eventually, these little twinges get worse and if not treated, affect our ability to perform at our best. So that's where it began! My feeling was, If I could learn to find and treat the root cause of these pains, I could stop them before they got bad enough to effect performance in every day life and on stage. I enrolled with London School Of Sports Massage and graduated with a BTEC level 5 in Sports and Remedial Massage Therapy. Since then, I have also gained a qualification in Massage for Pregnancy and Labour with London School Of Massage. 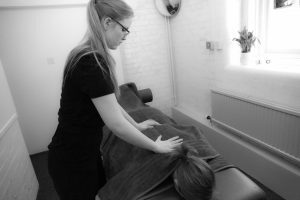 I'm trained in a range of techniques, including Sports Massage, Soft Tissue Release, Muscle Energy Techniques, Myofascial Release and Kinesiology Taping. I use a selection of these techniques to treat your body in the most effective way. We'll work towards goals we have set together, whether this is better performance in an upcoming race, or being able to get through a day at work without getting a tension headache. Everyone has a body and every body could benefit from Soft Tissue Therapy! I had six sessions over an eight week period with Lorna, with no major physical problems, but quite a few irritating niggles, which I had put up with for some time! Although I dismissed these things as every day wear and tear, Lorna was not content with this, and through discussion and further probing, she went about righting many wrongs. Lorna listens, thinks, researches and then goes about fixing the aches and pains, which I had put up with for far too long. Lorna explains everything she is doing in a precise and understandable way. Over this short period of time, and with the aid of helpful, specific exercises, Lorna helped me immensely and I cannot recommend her highly enough. Lorna is an excellent new therapist. Her technique is completely on point and her treatments are responsive to your needs - a rarity in soft tissue therapy, trust me! Her ability to understand my athletic needs was excellent and would highly recommend Lorna's patient and kind care. I'm so glad I had Lorna work with me on my hamstring problem. Thank you! Lorna is a warm, thorough and highly skilled practitioner. She takes time to understand you and your body; and creates a high-quality experience which is very informative, healing and therapeutic with long lasting benefits. Her anatomical knowledge is exceptional, and she applies it creatively and with strength to really get to the bottom of what's going on in my body! To book an appointment or ask some questions, send me a message below. I'm currently based at Refresh Wellness in Henley, within 15 minutes drive of Ipswich. Home visits can be arranged in and around the Ipswich area. I am able to travel further to Theatres and other places of work if multiple appointments are requested. Here's the an idea of the area I can cover.